A sturdy and low armchair with solid ash legs and the possibility of having a capitoné effect on the fabric. Extra customization can be obtained by using other choices of fabrics. Collection of sectional sofas with wood structure and expanded polyurethane foam upholstery. Removable covering in fabric or leather. Style excellence GIORGIOCASA is pleased to introduce its new furniture collections, in a preview exhibited at the Milan Furniture Fair 2016 and in this catalogue. The Byron is our traditional English wing chair, with its beautiful scroll wings, high, fully deep-buttoned back and classic Queen Anne legs. Finished with double hand-tacked studding lines, the Byron is the perfect study or fireside chair. 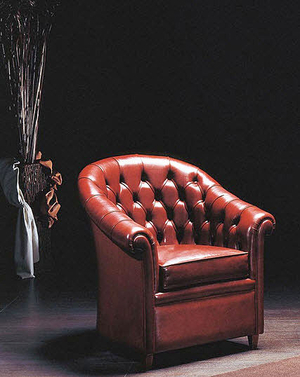 A chesterfield armchair, is often upholstered in leather, with a button-tufted finish and rolled arms. It usually has short wooden legs, but some sit on a wooden swivel base with casters. On ArchiExpo, this furniture is arranged by properties such as type (e.g., for commercial use). These pieces are found in homes and commercial settings, as part of a living room or lounge ensemble, or as an individual feature piece. An executive model with a pedestal swivel base can be used as a luxurious office seat for professional or domestic use. Traditional versions feature a solid wood frame, duck feather or other traditional padding and button-tufted leather upholstery. Modern chesterfields often use a wider variety of foam fillings, fabrics and finishes. Some have protective coatings to comply with fire-safety or other commercial standards and regulations, to facilitate maintenance and/or reduce production cost. Determine whether the chair's style, color and proportions are appropriate for the space. Consider construction quality, robustness and its resistance to heavy use, scratches, stains, fire and tears. A chesterfield made using traditional joinery and untreated or dyed leathers represents a good long term investment for the home, but also requires more maintenance, and is more costly to repair or replace.